This month we are having a bird-themed exhibition with work by Cambridge-based artist Alison Hullyer. 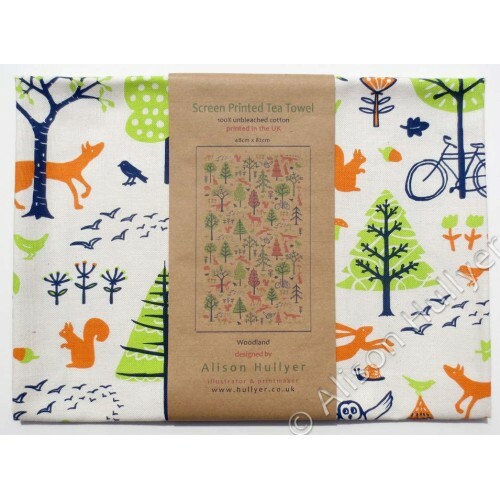 Alison’s prints and tea towels are longtime favourites at cambridge contemporary crafts and we're always excited to see her new designs. High time for a chat with one of our most popular artists! I did a degree in Graphic Design and Illustration, then set up my own business with the help of the Princes Trust. They lent me money to buy an etching press. I had my first printmaking exhibition in 1992 at the Lynne Strover Gallery. It featured work inspired by a trip to India and Nepal earlier that year. I'm still inspired by travel, both near and far. My most recent work features the wildlife I spot on my daily dog walks in Milton Country Park. I see kingfishers quite often, which is always a thrill. One of them features in my latest drypoint print. I seem to keep ideas in my head for ages or make little drawings of possible compositions in my sketchbook. I take photographs of favourite trees or locations and use them as a starting point for a new print. Then I work out the size of a new piece and draw it out full size. Using the drypoint technique, I can achieve crisp black lines and white backgrounds, which I hope makes them feel quite contemporary. Adding watercolour by hand also makes each print slightly different. There's so many! I've always loved Matisse, especially his later more graphic work. I can't wait for Kettles Yard to reopen as the whole house in inspiring, especially the Alfred Wallis paintings and the gorgeous Brancusi head of Prometheus on the piano. I also love the work of children's book illustrator John Burningham and printmakers John Brunsdon, Elizabeth Morris, Angela Harding and Angie Lewin. I have to take the dog for a walk first or he doesn't settle. I then answer any emails that have come in and sort out orders that have come through. No two days are ever the same. I could be designing for the stationery industry using a combination of hand-drawn and digital artwork. Or I could be printing or painting all day, editioning work ready for exhibitions. I try not to spend too much time on social media but I think it is important to have a public profile as my work is so visual. Instagram seems to work the best for me as I can show the process, which people seem to like. I would like to produce some larger more abstract pieces. I will also shortly be running some printmaking workshops from my new garden studio. Alison's exhibition at cambridge contemporary crafts run until 21st March. Make sure not to miss it! We are open Monday to Saturday from 10am to 5.30pm and Sunday from 11am to 5pm.